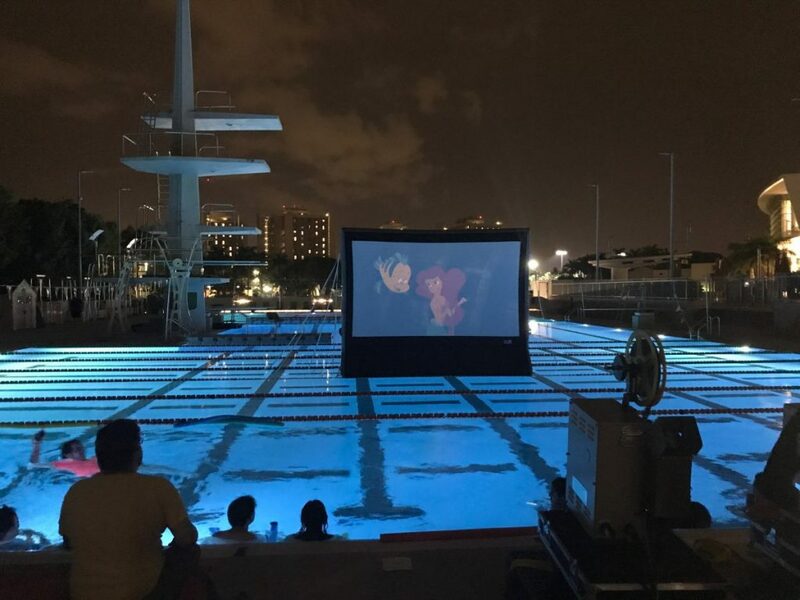 The UC Pool turned into a “dive in” cinema Sept. 3, where more than 100 guests watched Disney’s “The Little Mermaid,” projected on 35mm, from the comfort of pool floaties. After the screening, guests watched two drag queens perform their interpretation of the film. It was all part of of UM’s Flaming Classics, a film and drag performance series hosted by the Cosford Cinema and created by Trae DeLellis, director of the Cosford, and Juan Barquin, Miami New Times film critic. The series highlights the queer aspects of films and uses drag performance to merge performance art with film art. Pairing the films with a drag performance was a way to enhance the cinematic experience, Barquin said, especially for those who are too young to go to traditional drag performance venues. The event was cosponsored by the LGBTQ center at the University of Miami. Director Van Bailey said he loved the idea. Highlighting the queer aspects of “The Little Mermaid” was a stretch for DeLellis and Barquin, but ‘queer’ – as DeLellis points out – is an umbrella term. A queer analysis of the film is something members of SpectrUM, the undergraduate LGTBQ and allied student organization, find intriguing and beneficial for the community. “It’s interesting to see if the people that come don’t know that the movie can be read in a queer analysis, and it will be something they can learn,” SpectrUM ally series chair Alexa Skolnik said. The idea for this series came from a book that DeLellis read in graduate school, “Flaming Classics: Queering the Film Canon” by Alexander Doty.